This blog will endeavour to be a regular (-ish!) look at the things in life that fire my passion, such as Geology, Astronomy, and the world of science in general. When something stimulates my interest I will post my thoughts here and would be delighted to hear your thoughts too. So, if you enjoy what you read and would like to either link your blog to mine or just become a follower, I would be honoured to have you on board. Enjoy! How about some British Geology? With my head throbbing due to the new demands being made on the 'grey matter' lately, I think it's time to take a 'timeout' from Open University study and have a little look at some examples of the geology that Britain has to offer. My post vacation obsession with Arizona and Utah, has meant that Britain has been somewhat overlooked in this blob, so time to redress the balance a bit. While obviously smaller in scale, Britain's geology is no less interesting. Who guessed right? 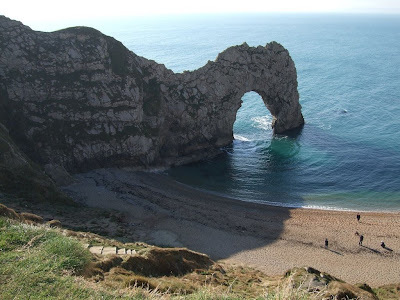 Yes, it's Durdle Door in Dorset, England. Striding Edge, Helvellyn, Lake District, Cumbria, England. This magnificent 'knife-edged' ridge or 'arete' was formed as two opposing glaciers started out on their respective journeys down their valleys, carving out the rocks beneath and behind them, until they met, forming this breathtaking ridge. 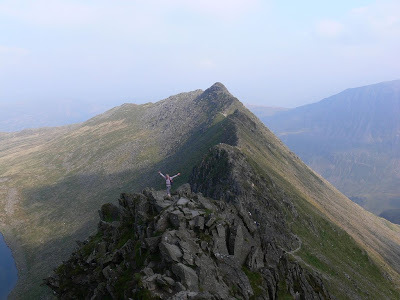 I've managed to negotiate Striding Edge on two occasions and thankfully got to the top safely enough. I believe there are a few people over the years however, who have not! Negotiating the ridge can be a bit scary on a windy day and there have been a few who have a made a rapid descent. Incidentally, the photo above reminds me of a book I have called "Over the Edge" which as I think I have mentioned before, is a somewhat macabre record of the deaths in Grand Canyon. The girl in the above pic is doing what so many have done at various viewpoints at Grand Canyon, with a two thousand foot drop to their sides! After a split seconds loss of concentration - whoops, one messy descent! The drop at Striding Edge might not be quite as great, but it's certainly no less messy if you slip! I'm sure somewhere I will have stored away, a whole load of photos from my vacations to the Lake District and will have a few of Helvellyn and other beautiful features from the area. I think I'll go and have a 'butchers' and see what I can find! Anything interesting I will scan and post them on my next blog. So until the next time! P.S. Nearly forgot to tell you!! Got my first set of assignment marks for S104! For the first tutor marked assignment I got 100% and the first computer marked assignment I got 87%!?! Yeah, I know, bizarre innit? And the marks I lost on the CMA were REALLY stupid errors like writing a number from the question down wrong!?! So, a good start, but it's maths next and then chemistry after that, so the going is definitely going to get tougher, but that just means more of a challenge. Bring it on!!! 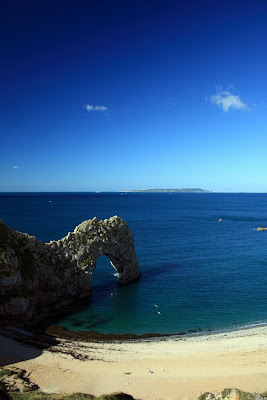 A beautiful photo of Durdle Door, Dorset, England. That's me at the most wonderful place on God's earth!